The eyelid’s kin is the thinnest on the face and is the first one that shows aging effects. Folded and wrinkled skin on the upper part of eh eyelids, bags under the eyes and fallen eyebrows might make a person look older, sadder and more tired, but, plastic surgery can help to improve this look. Blepharoplasty is an operation aimed to remove excesses of skin and fat on the upper and lower eyelids. This is usually done with cosmetic purposes. But it may also be done to improve vision if the skin falls folded interfering with sight. Blepharoplasty is the second most popular cosmetic process in America, according to the American Society of Plastic Surgeons. Most of these procedures are done with great success every year. Blepharoplasties are mostly done by oculoplastic surgeons (doctors specialized in plastic and reconstructive eye surgery), by plastic surgeons or surgeons of eyes, ears, nose and throat. Dermatologists (skin doctors) and general ophthalmologists are realizing this surgery too. What the process consists of? 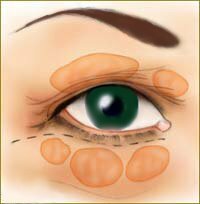 The most common type of oculoplastic surgery is the extirpation of skin and fat of the upper eyelids. Frequently, the surgeon reconstructs the fold to a higher level to give a more pleasing appearance. This method can be used to give Asian eyes a more western look as well. The excesses of skin and fat can be removed of the lower eyelids (bags under the eyes). This is done by removing the extra skin of up and down. Fallen eyelids can be properly improved through a process that tights up the ocular muscles. If more changes are required, these can be done during the process.